Bead caps, pins There are 29 products. 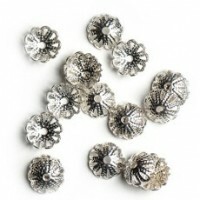 Nice filigree flower bead cap. 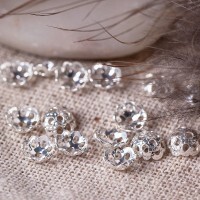 Match with 6mm and 8mm round beads. Material - brass. Color - platina. Made in Czech Republic. There are 20 pcs in the pack. 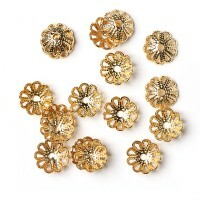 Nice filigree flower bead cap. 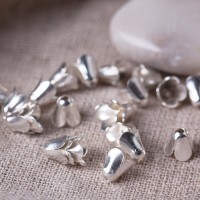 Match with 6mm and 8mm round beads. Material - brass. Color - gold. Made in Czech Republic. There are 20 pcs in the pack. 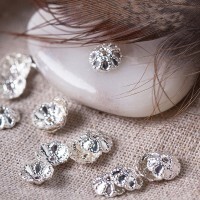 Bead caps, silver colored, 6 mm, 20 pcs. Bead caps, gold colored, 6 mm, 20 pcs. 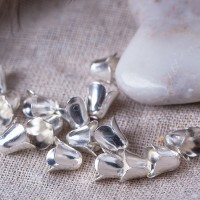 Bell bead caps, silver colored. 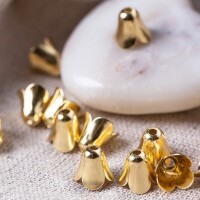 Bell bead caps, gold colored. 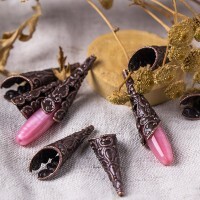 Nice filigree bead cones made from copper plated brass. Made in Czech Republic. 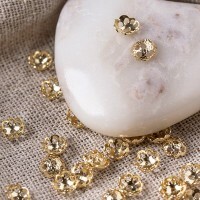 Eye pin, gold colored, 20 mm, 50 pcs. Thick high-quality eye pin for jewelry making. Color- gold tone. Size - 20 mm. Wire thickness - 0.7mm (about 21 gauge) There are 50 pcs in 1 pack. Made in the Czech Republic. Thick high-quality eye pin for jewelry making. Color- platina tone. Size - 30 mm. Wire thickness - 0.7mm (about 21 gauge) There are 50 pcs in 1 pack. Made in the Czech Republic. 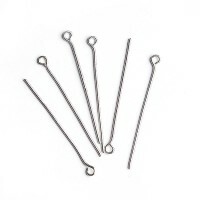 Eye pin, platina colored, 40 mm, 50 pcs. Thick high-quality eye pin for jewelry making. Color- platina tone. Size - 40 mm. Wire thickness - 0.7mm (about 21 gauge) There are 50 pcs in 1 pack. Made in the Czech Republic. 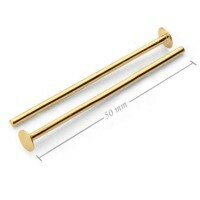 Eye pin, gold colored, 40 mm, 50 pcs. Thick high-quality eye pin for jewelry making. Color- gold tone. Size - 40 mm. Wire thickness - 0.7mm (about 21 gauge) There are 50 pcs in 1 pack. Made in the Czech Republic. Thick high-quality eye pin for jewelry making. Color- platina tone. Size - 50 mm. Wire thickness - 0.7mm (about 21 gauge) There are 50 pcs in 1 pack. Made in the Czech Republic. 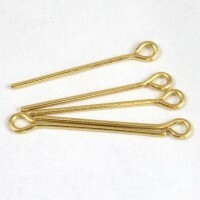 Eye pin, gold colored, 50 mm, 50 pcs. Thick high-quality eye pin for jewelry making. Color- gold tone. Size - 50 mm. Wire thickness - 0.7mm (about 21 gauge) There are 50 pcs in 1 pack. Made in the Czech Republic. Thick high-quality eye pin for jewelry making. Color- copper tone. Size - 50 mm. 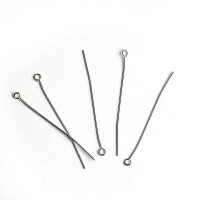 Wire thickness - 0.7mm (about 21 gauge) There are 50 pcs in 1 pack. Made in the Czech Republic. 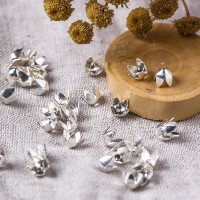 Thick high-quality head pin for jewelry making. 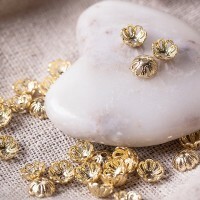 Color- goldplatina tone. Size - 20 mm. Wire thickness - 0.7mm (about 21 gauge) There are 50 pcs in 1 pack. Made in the Czech Republic. 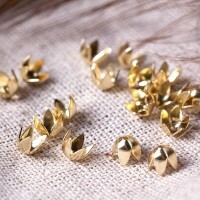 Head pin, gold colored, 40 mm, 50 pcs. Thick high-quality head pin for jewelry making. Color- gold tone. Size - 40 mm. Wire thickness - 0.7mm (about 21 gauge) There are 50 pcs in 1 pack. Made in the Czech Republic. 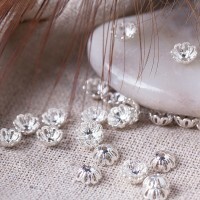 Head pin, platina colored, 50 mm, 50 pcs. 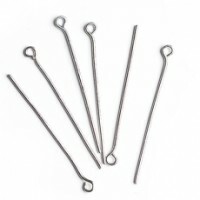 Thick high-quality head pin for jewelry making. Color- platina tone. Size - 50 mm. Wire thickness - 0.7mm (about 21 gauge) There are 50 pcs in 1 pack. Made in the Czech Republic. 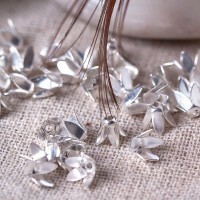 Thick high-quality head pin for jewelry making. Color- gold tone. Size - 50 mm. 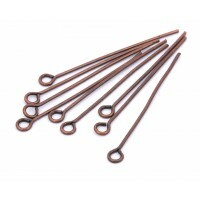 Wire thickness - 0.7mm (about 21 gauge) There are 50 pcs in 1 pack. Made in the Czech Republic.